The chart below represents the working repeat for a twin leaf that incorporates ribs in fabric. Golden color represents needles in work on ribber or Passap back bed, the numbers in the center of graph the number of needles moved away from center column, toward the wider rib on each side of the repeat. All colored areas within the red border represent black squares on mylar, or single palette color in SP, wincrea, or your means of downloading. The addition of electronics allows for a wider repeat. Air knitting on any machine will help make selection needed for transfers to opposing bed. On the Passap use Tech 129 and color reverse. This results in pushers corresponding to each colored square being selected to their up position: they then in turn may be pushed up slightly to help track the needles that need to be moved. The wider ribs on the sides make it easier to identify repeat center: again, transfers are made away from the single needle, toward the larger group. The front lock stays on N througout. 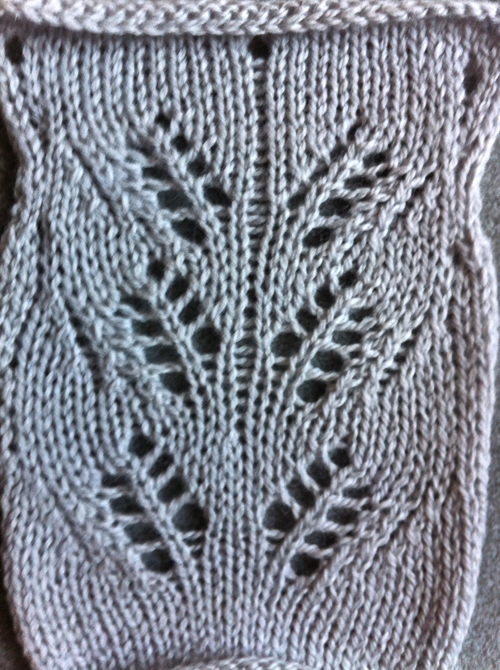 Pushers corresponding to needles on the back bed, not in twin leaf pattern area, need to be completely out of work. 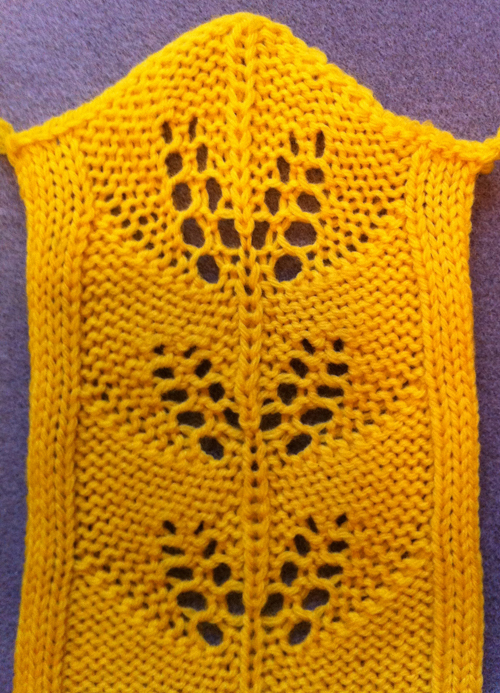 Back lock also knits throughout. Having only 3 needles at each end of the chosen number of repeats knitting on the ribber or back bed, will create a small rolled edge on each side of the knit, using the irritating property stocking stitch has of curling to purl side to create an “edging”. I have multiple stitch transfer tools for Passap, but found I did much better avoiding dropped stitches doing larger transfers in two moves of fewer needles. The graph may be modified for use in other electronics. Here the gold represents needles out of work that create ladders. 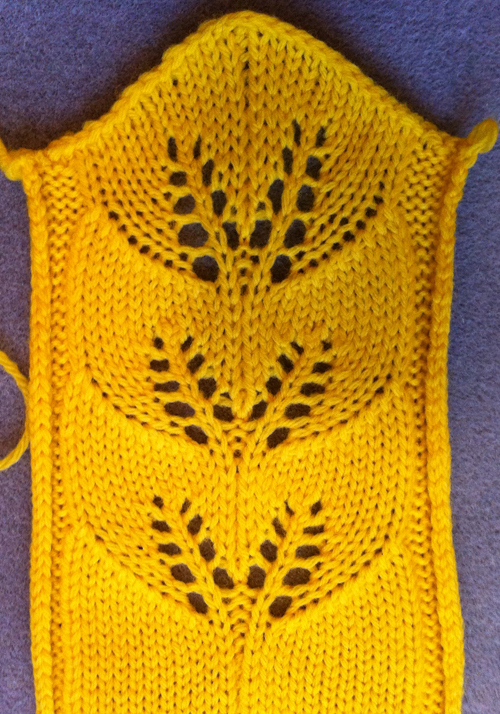 The two stitch ladder helps with definition and with tracking direction of transfers. With ribbers in use cursed dropped stitches and holes may not be noticed until it’ s too late for “repairs”. 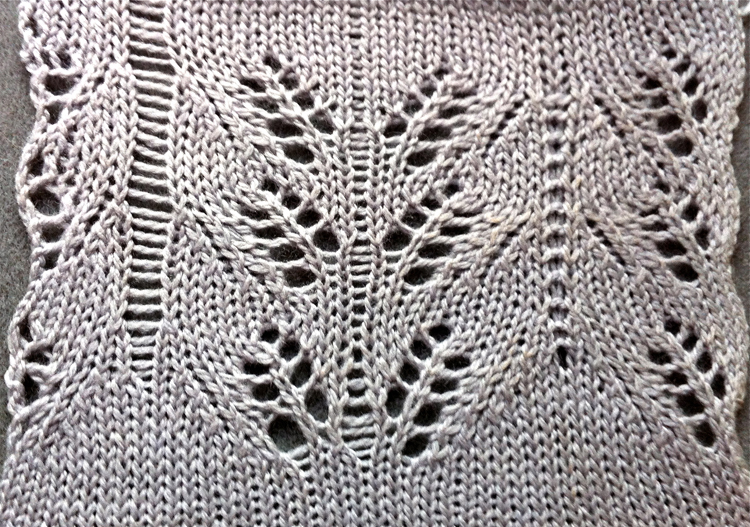 Again the center numbers reflect the number of stitches requiring movement on that particular row. All colored squares are used for “drawing” the repeat in the design program or on the mylar. 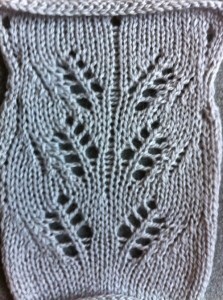 The result is definitely not a twin, but rather a distant relative of the twin leaves, more akin to wheat or fern lace. The design works within the punchcard 24 stitch repeat limit . A central ladder again helps definition. Latching up the ladder on the purl side made it disappear. Playing with ladder spaces between full repeats can vary the fabric considerably. 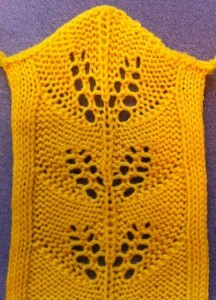 This is the self drawn card used for the swatch, the horizontal heavy lines indicate where the 2 rows of knitting occur. The card uses up the whole 60 rows, all punched holes are identifiable with corresponding row numbers, the card was a touch too long for my scanner. 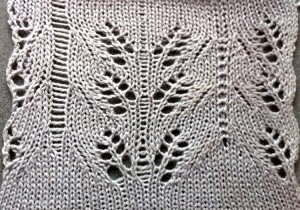 Patience is a requirement, and yarn color that allows one to see what is actually happening to stitches is a recommendation.